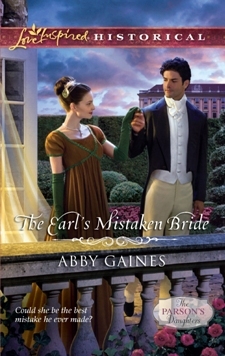 The Earl’s Mistaken Bride is the most delightful Regency I’ve ever read. My senses tingled as I perused the back cover. Anticipation grew upon reading the front teaser blurb. And my imagination soared as I delved into a world where a season wasn’t related to the weather and a ton didn’t refer to a measurement. This is not my normal Old West fare, yet Abby Gaines drew me in with fascinating fleshed out characters trying to lead normal lives in a society most of us can’t even imagine. My anticipation for this book stems from the fact that it’s along the lines of a mail-order bride or arranged marriage story where the groom and bride don’t meet until the wedding is imminent. They must learn to put aside petty grievances and become respectful partners under strenuous circumstances. What a way to start a marriage, but hopefully, love will follow. Lord Marcus Brookstone’s besotted grandfather allowed the Spenford estates to fall into disrepair when he neglected his duty and put all his attention on his wife. Marcus’ father reversed the damages expounding to Marcus that love was their enemy. He made Marcus put aside his childhood friend, a common gamekeeper’s son, and instilled in him the theory of class distinction. As the future earl, Marcus was to set himself apart from everyone except those of his class. He was not to claim love, friendship and other vices, concentrating solely on unemotional pursuits pertaining to the Spenford estate. Above all, he must never let his deportment flag or do anything to incite the tiniest scandal. Marcus did not want to marry lest he be tempted to fall in love with his wife. Besotted men make fools of themselves. They throw pride and deportment by the wayside and care not what others think of them. They forget who they are and everything they stand for. That is Marcus’s greatest fear. There’s only one person he shows affection for and that’s his mother. He’s so stricken when it appears she may die, he makes a deal with God… Marcus will find a wife to give his mother peace and in return, God will heal her. Who’s he going to marry? By rights, he should marry someone of equal birth, a woman of great beauty who looks and acts like a countess. But all the women in his circle think only of wealth and status… of spending their wealth to draw attention to themselves. Certainly they’d make demands on him. Maybe even tempt him into falling in love. And that would be the ruin of them all! Marcus cannot go that route. Instead, he goes back to his country estate knowing the parish reverend has five virtuous daughters—a necessary trait for a countess—he remembers that two of them are great beauties. He can’t remember their names, but that is a minor detail and easy to discover. On the way through the village, he finds one of the reverend’s daughters fending off a suitor. She’s quite beautiful and Marcus is instantly attracted. If he has to look at a wife across the table, she may as well be comely. In reply to his query, she coyly says her name is Constance Somerton. She requests that he not report their meeting to her father because she’s not supposed to be down in the village. Marcus is taken with her flirtatious ways and promises not to say anything. Why would he? His problem is solved… she’s the perfect Countess of Spenford. When the reverend asks Constance if she’s willing to marry the Earl, she thinks back to three years earlier when he helped her save a puppy in distress. She fell in love with him at the time and although she hasn’t seen him since, he obviously feels the same if he’s specifically asked for her hand. Elated that God has chosen to bless her for her faith in His guiding hand, she eagerly waits for her wedding day. Surprised and confused, Marcus stares down at his new wife. She isn’t the girl he met down in the village at all. She’s plain and angular where only beauty will do. She looks nothing like a countess when being a proper countess counts for everything! And as they ride off in their coach toward their new life together, he leaves her huddled in a corner alone. Because there are two things that he’s sure of… first, he kept his part of the bargain, so his mother will live. And second, he doesn’t know what game his new wife is playing, but at least with her conniving nature and plain face, he isn’t in any danger of falling in love. Poor misguided Marcus and Constance with her dashed dreams. This marriage is going to take a lot of work. As a Harlequin SuperRomance novelist, Abby Gaines knows how to crank the tension out and she does it throughout the book. My emotions kept me glued to the pages, but the conflict kept me turning them. Like all happily-ever-afters, I breathed a sigh of relief at the end, but was sad it was over. The snappy dialogue and attention to detail would have kept me entertained for twice as long. I can’t wait for Abby Gaines's next novel. Disclaimer: I did not get this book for free... I paid full price for it and believe it's worth every cent. 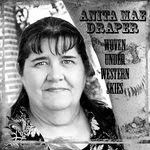 Anita Mae, this is a fantastic review. Very well done, and it really makes me want to read this book. Thanks! I loved this book too! And what a great review! Hmm...you know I'm not usually a Love Inspired reader, but this sounds pretty good. But don't you think it would have been even more fun if he wanted a plain girl he wouldn't fall in love with and accidentally ended up with a fatal beauty. LOL. Terrific review, Anita! And your "disclaimer" made me chuckle! Maybe I will, Suzie, but I'll set it on the prairie with Amish and vampires. Lol, Dina! Vampires are not my friends, but if you write it, I'll read it because I think you could pull off anything. Dina and Suzie... that's what I thought at first. And then as I began to really know Marcus, I realized that image is EVERYTHING to him. He must be above reproach and so must his wife and everyone in his household. A plain wife will draw attention and possibly even pitying looks. And that will start gossip. Marcus would rather fight the temptation of a beautiful wife than hear rumors directed at his earldom. In modern terms, Marcus needs a trophy wife hanging on his arm. I added that because I've been going through oodles of book reviewers while working on my comparative titles and it seems every one of them mentioned that they'd received the book from some publisher or other. And then I came across one with a 1 star rating where the reviewer had annotated that she'd bought the book and wished she could get her money back. It reminded me that I'd bought this one through eHarlequin.com so why not flaunt it and give oomph to my review. However, we don't have any Amish or vampires out here. Wow, what a great review! I confess I've been wanting to read this. Now I know I need to hurry up and buy it. Thank you! Anita, I have to agree with you. I LOVED everything about this book. Abby hit every mark perfectly. What a fun read. Susie, that's a good plan. I normally don't tell people they'll enjoy something because really... how would I know that unless I'm wired to their mind? Mary, she did, didn't she. I remember talking with her at RWA New York and she was so worried about it because she was taking a chance on 2 fronts... it being a historical, and it being an inspirational. I really think she did an excellent job on both fronts.